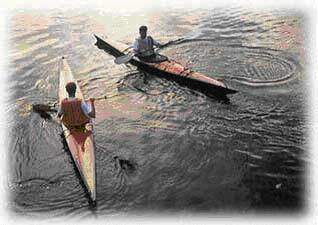 The best aerobic exercise in Arizona, good for all ages, is paddling a kayak. It doesn't put a strain on any joints. I t provides a regular rhythm for a fat-burning heart rate. It is a great stress-reliever, and it provides a calming link to nature. Best of all, it is fun! Kayaking is an all-purpose exercise, with something for everyone. I'm not talking about the whitewater action you may have seen on television. Although we have river kayaking on the Verde and the Salt, I'm talking about a flat-water paddle on any on Arizona's beautiful lakes and reservoirs. You can paddle by yourself, with a group, or make it a fun-filled adventure for the entire family. You can do it for exercise, nature-watching, fishing, or just plain fun. You can join an organized group paddle, or roll your own. Wherever you live in Arizona, you are an easy drive from a beautiful waterway. Kayaking is one of the least-expensive watersports. All it takes is a boat, a paddle and a personal flotation device (PFD). You can rent a boat, build a boat, or buy a boat. I personally recommend renting several different kayaks before making any investment. Rentals will include an entry-level paddle and some form of PFD. Rentals in the Phoenix area usually include racks or pads and tie-down straps for easy transportation of the boats. Carrying the boats is a lot easier than you might think, and you can use any kind of vehicle. I love the looks I get driving my Miata with a 19 foot kayak on it. Whatever you do, do not walk into a big-box store, see a kayak on sale, and make an impulse purchase. Unless you are in a specialty shop, the chances are the person selling you the boat will know less about it than you, no matter how little you know. You will park the boat in your garage, let it collect dust for several years, and eventually put it in a garage sale or give it away. You won't buy a car without driving it. Why would you buy a boat without paddling it? The only piece of equipment you might consider buying is the personal flotation device (PFD). The law requires you to have a PFD on board, and the easiest, most practical and intelligent place to store it is on your body. It is always best to use a PFD designed for kayaking, and for your body type. Modern materials are light and trim. PFDs are designed for all body types. A good PFD provides back support, safety insurance, protection from the sun, and a convenient place for your keys and other personal items while you are on the water. A properly fitted PFD is a prerequisite to fun on the water. A benefit of kayaking is you can go boating in places where other boats can't. You can also drop in to the water anywhere you have access to the shore. Several of my friends are fishermen who started kayaking just to get to the places where the big fish hide. One of the best ways to get started is to take an introductory kayak class or sign up for a guided kayak tour. The ranger at Lake Pleasant has free tours every month. In future columns I will talk about types of kayaks, the materials used to make them, necessary equipment, clothing, and transportation. I will also cover some of the best places to paddle in Arizona. For now, I recommend you take a kayak "quick-start" lesson that will include all the information and skills you need to get started in this great sport. You can find useful links at www.canyonsandcoastlines.com on the Web, or visit your local kayak shop. If you need to rent a kayak, call Thor at (480) 968-1140, and you can always reach KayakJay at (602) 359-1354, or e-mail kayakjay@msn.com.